Preheat oven to 200°C/400°F. Peel butternut squash, slice in half, and remove the seeds. 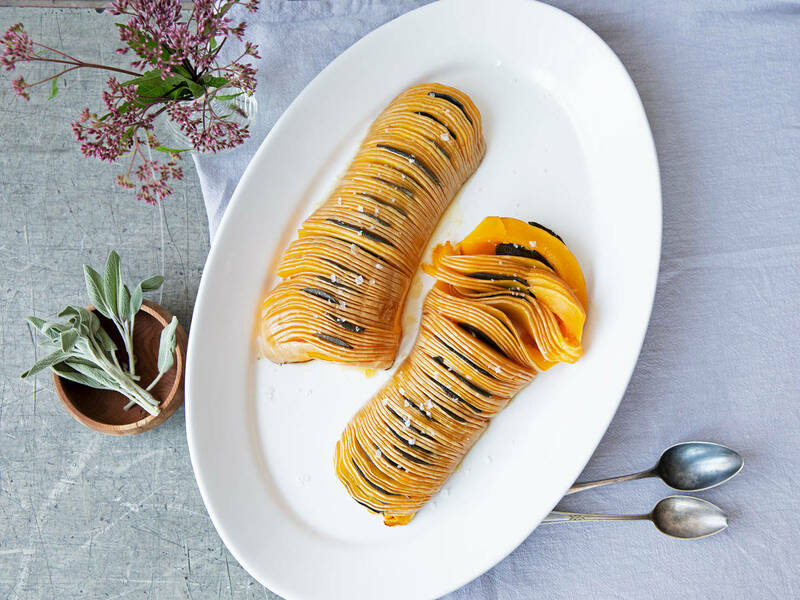 To help you slice in the Hasselback style, place two skewers on either side of the butternut squash halves – this will prevent your knife from cutting all the way through. Slice thinly and repeat the process for the other half, then transfer both butternut squash halves to a baking sheet. Heat the clarified butter in a saucepan and cook until browned and foamy. Add maple syrup and stir to combine. Season with salt and pepper. Place sage leaves between the butternut squash slices and brush both halves with some of the clarified butter mixture. Bake in the oven at 200°C/400°F for approx. 50 min., or until the butternut squash is soft and browned on the edges. Baste the butternut squash with the clarified butter mixture approx. every 10 min during the baking time. Remove from the oven and serve on a large plate with a drizzle of maple syrup and some sea salt. Enjoy!